With The Companion Chronicles and The Early Adventures currently focusing exclusively on the eras of the First and Second Doctors and The Lost Stories having finished its run long ago, The Third Doctor Adventures is currently the only place to go for fans and aficionados of the Third Doctor to experience a full cast reimagination of that beloved time. Comprising- to date- two stories annually, the range has made the most of Tim Treloar’s uncanny performance as the late Jon Pertwee to evoke the spirit and mannerisms of the long-standing actor, and the third volume once more pairs him with the inimitable Katy Manning as stalwart companion Jo Grant. Nicholas Briggs’s ‘The Conquest of Far’ opens the third volume as the Doctor and Jo arrive on the aptly-named planet Far, a world home to the Hyper Gateway built to alleviate travel and thus hardships across the vast Earth Empire. Rather than arriving in time to attend its grand opening, however, they find that they have arrived far later in this planet’s timeline to a time when the Daleks themselves are in control of the Gateway and the Earth Alliance is poised to strike back. With secrets and the possibility of betrayal lurking behind each and every corner, nobody is ever safe as efforts intensify on all sides. Being unquestionably Doctor Who’s most iconic foes, the Daleks have also been increasingly difficult to write in new and exciting ways given the sheer number of times they have previously been defeated at the Doctor’s hands. Fortunately, the Daleks in ‘The Conquest of Far’ are written as a truly credible threat rather than as a force simply relying on numbers and firepower alone, meshing elements of the classic era with a tactical skill and sense of foresight rarely seen. The Daleks hold the power with the Gateway in their clutches, and even if they don’t recognize this particular incarnation of the Doctor, they know all too well how important his TARDIS and companions are to him. Yet they go beyond their usual threats here, having perfected their robotization process to the point that anyone could be their spy without even the affected individual knowing it. With a resulting knowledge of every event and the ability to foresee the Doctor’s attempted deception as they threaten to unleash a weapon that can robotize any attacker, the Dalek force presented here is one of the most formidable in their history. 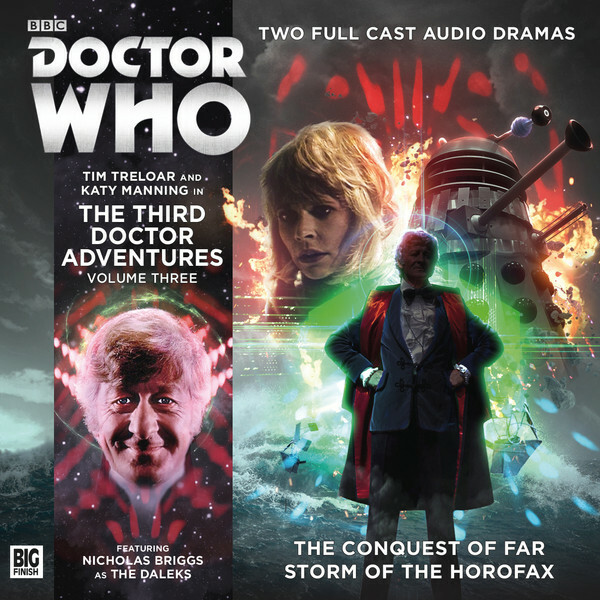 Of course, ‘The Conquest of Far’ is not solely about the Daleks, and Tim Treloar and Katy Manning continue to impress as they recapture the essence and chemistry of the early 1970s expertly. Once again, for those not going in expecting a perfect impression of Jon Pertwee, Treloar is able to bring Pertwee’s quirks and authority to the forefront of his performance magnificently, and there are certainly moments where he absolutely is Pertwee in every respect as the script takes the Doctor to wholly unexpected places. Manning, likewise, is able to impressively turn back the clock to recapture her earlier tones, and Jo here is written as a very proactive character tackling the problem from her own end as well. As is typical with Big Finish adventures, each of the cast members gives a superb performance that adds nuance and depth to both the horror and hope around them, and George Watkins deserves due plaudits for his performance as Delralis who becomes so integral to the plot. It’s difficult to craft a rewarding Dalek story that doesn’t simply retread old territory, and though the pacing does let up a bit as the scene is being set, ‘The Conquest of Far’ as a whole is a solid adventure that proves once again that the deviousness and mercilessness of the Doctor’s oldest foes know no bounds. With Treloar and Manning again proving to be a powerhouse leading duo and the usual strong direction and sound design in place, The Third Doctor Adventures Volume Three is off to a satisfyingly strong start.